When you travel some of northwest Baltimore County’s high-traffic corridors, you observe the good, bad and ugly on busy main roads, staid strip shopping centers and outright commercial blight. The 2008 financial collapse did not just hit residential properties, it took down numerous businesses, sapping the area of once-vibrant offices, restaurants and retailers. What’s left in many communities are the remnants of banks, fast-food and grocery stores, and national retail chains that succumbed to intense industry competition, consolidation and declining sales. Some of this evidence appears as vacancies within malls and shopping centers. For example, when the family-owned Mars supermarket chain closed 13 stores, Weis agreed to acquire five of them, but the Reisterstown location was one of the unfortunate ones. That 42,000-square-foot store closed last year, along with eight others, due to a lagging sales performance. Retailer hh gregg, which offered home appliances, electronics and furniture from a shopping center with Home Depot on Baltimore National Pike (Route 40 West) in Catonsville, is looking for a tenant after closing earlier this year. Down the road at Pike Park Plaza also on Route 40, Sports Authority met its fate after the sporting goods chain filed bankruptcy. Even more visible than those stores are the shuttered gas stations, most of them Gulf stations on corners of busy intersections, and stand-alone vacant businesses on busy roads such as Route 40, Security Boulevard, Liberty Road and Reisterstown Road, which create distress and eyesores for residents and commuters. Most of the businesses’ signage has been removed, and some are in derelict and decaying condition, giving the buildings an even more ominous appearance. 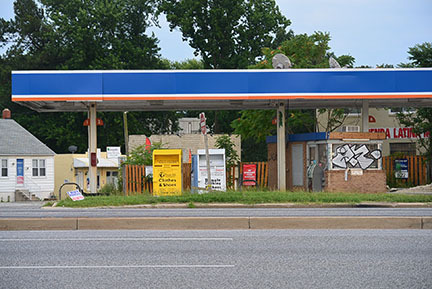 A few examples: On Reisterstown Road in Reisterstown, 7-11 and Gulf gas stations are shuttered. In Owings Mills, Shoppers Food and Pharmacy, which closed in 2011, remains a looming empty space in the 11100 block. Frank’s Nursery and Crafts, which after filing for bankruptcy in 2004, shuttered its 169 stores, including the location at Tollgate Road. Plans for a RiteAid, then an automotive lot have not yet materialized. Not far from Foundry Row in Owings Mills, which was developed from the demolished Solo Cup property, are the vacant Fuchs and Lion Brothers facilities. Lion Brothers, at one time the largest manufacturer of embroidered emblems, moved from its six-acre Reisterstown Road site to more space in an Owings Mills corporate park. It had been vacant for about three years. Earlier this year, Rite-Aid acquired Fuchs, which stopped making seasonings at the 80,000-square-foot headquarters and relocated to a newly constructed site triple its original size in Carroll County this summer. Krispy Kreme returned in September, a short distance from the demolished shopping center that once housed Signs by Tomorrow, a restaurant and cell phone business. A CVS is being constructed there. On Security Boulevard, the most visible blight is the old International House of Pancakes and Bennigan’s restaurants that sit with boarded windows and doors and worn roofs on the property in front of Security Square Mall. Bennigan’s has been closed for around eight years, and IHOP even longer (two pay phones are outside the front door). David S. Brown Enterprises announced that it is taking steps to acquire the Security Square Mall properties and turn the space into office, community and retail space and restaurants. 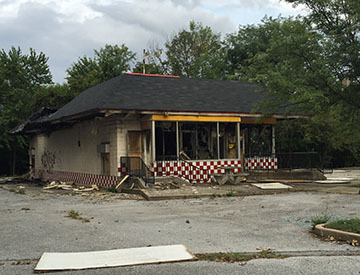 Between Woodlawn Drive and Gwynn Oak Road, not far from Social Security Administration is the gutted McDonalds, which was an eyesore before it caught fire in August. Another McDonalds franchise is vacant on Route 40 in Catonsville. Also in Catonsville, cement barriers block the entrances to the Gulf gas station at Route 40 and Winters Lane, which stopped pumping gas months ago. Debris litters the unsightly property. There are signs of progress and renewals, as a few buildings have gotten new leases and new life. Inside the beltway, the once vacant 15,000-square-foot Office Depot in the 1600 block of Reisterstown Road in Pikesville is now a Seasons, which is attracting shoppers looking for a variety of kosher food. While maybe not the most desired solution, The Best Buy on Security Boulevard across from the mall will become a storage facility. Last year, the electronic retailer closed the underperforming Woodlawn store. The Food Lion that shut its doors to shoppers at Kings Point Shopper Center in Randallstown is now a Tractor Supply Co. While community members lamented the fact that another grocer was interested in replacing Food Lion, they preferred the business to an empty space at that corner. Read about the plans for vacant buildings and what our county government and elected officials have to say about the problem. 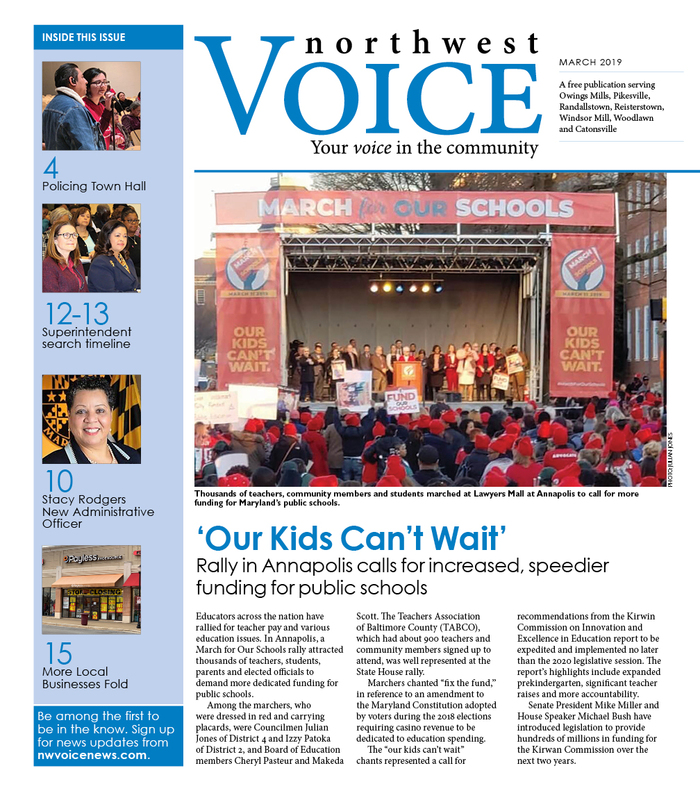 Welcome to the Northwest Voice! Our goal is to inform, inspire and celebrate you, the community and readers. ©Northwest Voice 2016. All Rights Reserved.